What comes up in search engines when people type in your name or company? Good results? Bad results? Truth? Lies? What if you could control it with SEO? Reputation management… you can do it! Google improved the sitelinks functionality for top results in a query. Up to twelve indented results under the main result with snippets. Gold! You can command nearly half a page of Google search results by building traffic to your site and creating quality content. As my traffic started to build I noticed one day that the sitelinks just magically appeared. I had gotten sitelinks for my clients before. Having traffic helps, and having certain pages in demand helps Google determine which pages are important and should be included. It turns out that sitelinks are quite useful because they can help predict which sections of the site you want to visit. Even if you didn’t specify your task in the query, sitelinks help you quickly navigate to the most relevant part of the site, which is particularly handy for large and complex websites. Sitelinks can also give you a good overview of a website’s content, and let webmasters expose areas of the site that visitors may not know about. If you are thinking of applying for jobs, it’s a known fact that recruiters are Googling your name. I’m amazed at how many people have no online reputation… even people in the digital space. How can you say you are an expert in anything and not get found online? Alas, some offline people can still get away without an online reputation… for now. But all it takes is for one disgruntled person to damage your online reputation before it even starts. This is really easy to do if you don’t have an online trail. No one can do this to me. Why? Because I own my name in the online space. My content on the Web that I’ve developed for years…. in fact since 1999, gives me credibility with Google. 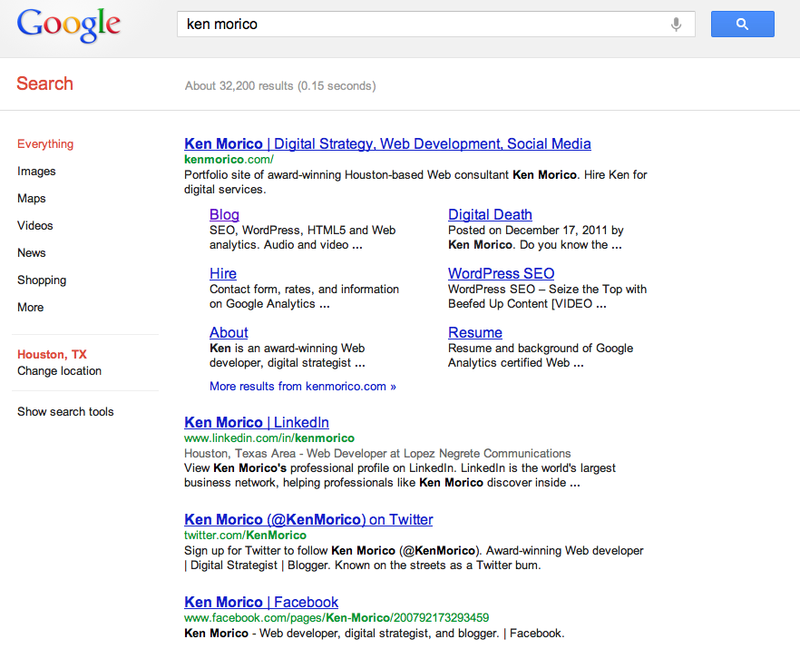 When people type in my name in Google, I own half a page of content. Sites with lower credibility get buried, and with a little optimization I can bury even credibile sites that seek to defame me. That’s power. And you can have it too. The single best thing I can think of to get credibility with Google is to create great content. The best way to do this is to blog. Social media, to me, can be a real waste of time. The shelf life of postings tends to be around 20 minutes. When I write a blog post, that post is working for me 24/7 365 days a year. It’s an investment. Because I care about writing and helping people, I should get some credit. Right? When I wrote for print publications like The Los Angeles Times it was the byline that I cared about. 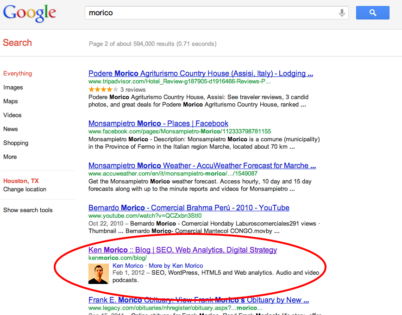 Now, it’s the Google Authorship display. The authorship display gives you credibility. Especially now, since not everyone is doing it. I explain the Google Authorship Markup in this post. Google Adwords can be sneaky. Your competition can trigger ads to display when users search for your company name. They can lure them with discounts and special offers, as well as write lies about your products or service. That’s why it’s so important to get the top spot for your name in organic search. You also might have to outbid your competition in Google Adwords to control your reputation. Paid search is a shortcut. Remember that. A great example of this was BP buying search terms during their oil spill. They took ownership of their name and the event. They had the money to do so. Like other parts of SEO, optimization goes very deep. How do you control your brand and good name? Please comment below. Thank you Ken! Fantastic content and clear instructions the average person! I am starting my own business (a lifelong goal, I am pursuing with belated fervor at 49) and this is SO HELPFUL to me. Hi Ken, your site seems down. 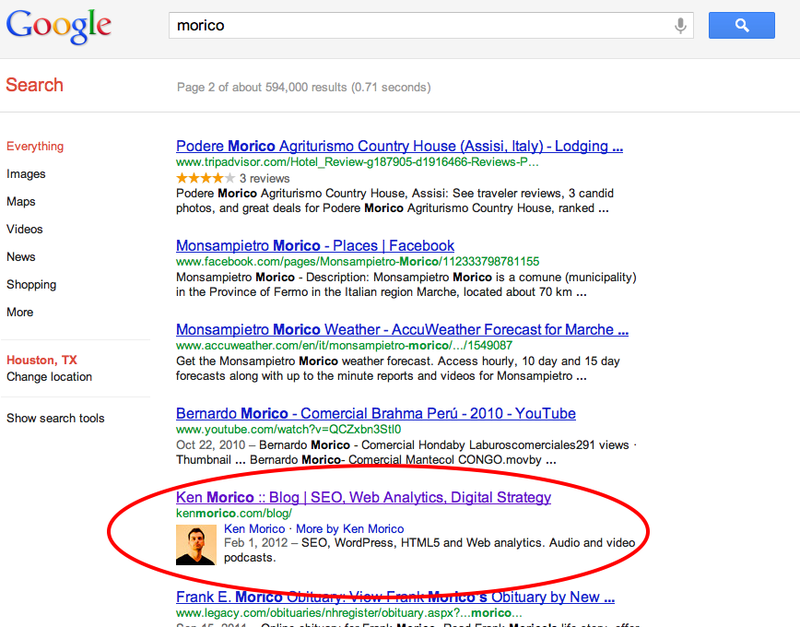 I did a search on google “ken morico” and “kenmorico.com” But i couldn’t find sitelinks? Hi Phan. I am seeing the links on my side. Sometimes it takes Google a while to propagate to all their servers. Especially in other countries it might take a little while.